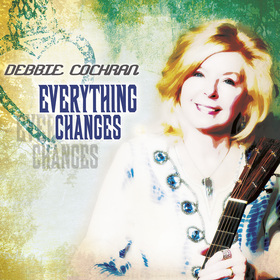 With previous traditional radio hits including What's Going On and It's Never Too Late, classic country artist Debbie Cochran is thrilled to announce the release of her brand new single, Everything Changes. Music Programmers can find it on the newest CDX #598, which was released today (Monday, June 23rd). It is also available on AirPlay Direct at www.airplaydirect.com/music/grassrootspromotion. Everything Changes is the lead single off her brand new album Bigger Than Life, which was produced by well-known Kent Wells (Dolly Parton). Debbie graces listeners with 10 new tracks, highlighting the diversity in her songwriting abilities-singing songs of heartache, change, and triumph. Her encouraging lyrics are complimented by soaring melodies and wailing guitars, showcasing Debbie's pure traditional sound. She most recently received an honorable mention from the Singing News as a Top New Artist of 2014. Debbie couldn't think of a better time for the release of this song by stating, "Writing songs and performing is my passion. I've put my heart and soul into this new record, and I can't wait for everyone to hear it." Debbie is winning the hearts of radio stations and music fans nationwide and is an inspiration to those who still have dreams they want to achieve. This Batesville, AR native has dedicated her Golden years to pursuing her childhood dream of being a singer and performer. With several albums and singles under her belt, including earning the DisCovery Award from renowned music critic, Robert K. Oermann, you could say that she is doing what her heart has always desired. With influences like Reba McEntire, Loretta Lynn and Kitty Wells, Debbie continues to develop a firm foundation for her traditional ‘halo-country' and is well on her way to creating a career that is Bigger Than Life. For media requests, contact PLA Media at 615-327-0100. Radio stations can download the song at www.airplaydirect.com/music/grassrootspromotion.